O-H! 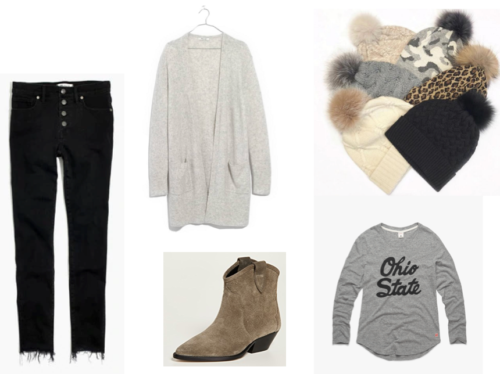 We love a good tailgate as much as the rest of Buckeye Nation, and you know what they say…nothing goes better with food, football, and fun than the other F word–Fashion! Okay, maybe they don’t say that, but we think they should! Because it’s not whether you win or lose, it’s how you play the (Fashion) game ;)Time to Tailgate in Style! I-O! This look is sporty, yet touches upon the logo trend we are so loving. It’s chic, cheeky, and casual. Perfect for a laid back tailgate party, or watching at your favorite IT spot in the Short North. Sweater: Free People, Nordstrom. Denim: Levis. Hat: Gucci, Saks. Shoes: Golden Goose, Far Fetch. If you’re a boho gal, you might also be loving the Western Revival trend. This football-friendly look is a great mix of both. 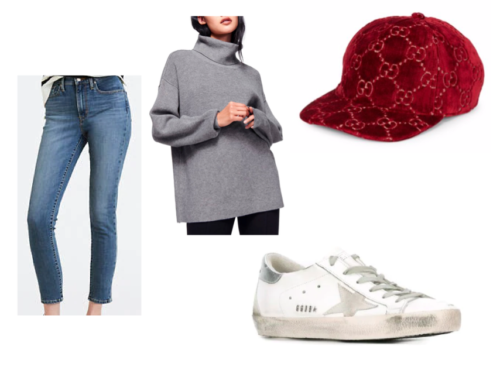 Add some print with the leopard pom hat, but really any of these neutral hats will work–just choose the right one for your hair color and skin tone!! This is a true tailgate-at-the-stadium before heading in to watch the game look! Tee: Homage. Sweater: Madewell, Nordstrom. Denim: Madewell. Pom Hat: Rowe. Western Boot: Isabel Marant, Shopbop. This look is sophisticated, and belongs at Hudson 29…close to the game in Upper Arlington, but within reach of your favorite glass of Chardonnay. Or if you’re a season tickets holder in box seats, this is your look! 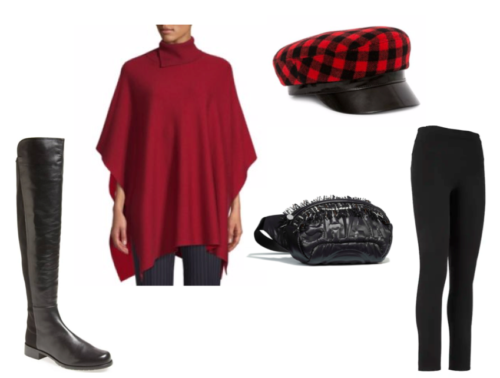 We love the touch of plaid in this great newsboy hat, and the nylon and tweed Chanel fanny pack is a showstopper! Tip: Wear it at your natural waist OVER the poncho for a tres chic look. Poncho: Boss, Saks. Over-the-Knee Boots: Stuart Weitzman, Nordstrom. Hat: Avec La Troupe, Saks. Leggings: Athleta. Fanny Pack: Chanel. Christy graduated with a degree in fashion merchandising from Kent State University and with a master’s degree in marketing and communication from Franklin University. She worked as a visual merchandiser for Columbus-based tween brand Justice and Fortune 500 Columbus-based retailer Abercrombie & Fitch before joining Wardrobe Therapy. She lives in Worthington, Ohio with her husband and daughter.